Alley Ward has a secret—the kind of secret that can level a city block. Her plan had always been simple: Complete her medical doctorate and find a permanent cure for her unstable “condition”. But things aren’t simple anymore. Now she’s being hunted by dangerous creatures that can hide among us. Now there’s a new plan: Stay alive. Will Alley survive long enough to unravel the truth behind her mysterious past and help prevent a war that threatens to destroy our world? 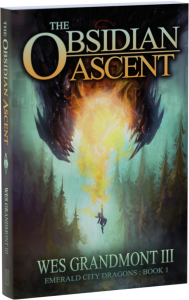 The Obsidian Ascent is the first book in the Emerald City Dragons series, an action-packed fantasy set in and around Seattle.